Each year, millions of people acquire foodborne illnesses from bacteria and viruses - including in restaurants, catering or banquet facilities, and other locations. It's estimated that 1 in 10 people fall ill to foodborne diseases. The costs of these outbreaks are tremendous - not only in terms of the health implications for the medical costs, lost time from work, and unfortunately too many premature deaths. However, these costs can also extend to the businesses as well. Simply search for articles about outbreaks in restaurants or visit a site like Food Safety News, and you will find an abundance of recent stories of outbreaks, lost revenue due to closings necessary to deal with the bacteria or viruses at hand, and even lawsuits. While there are many strategies to help reduce the risk of outbreaks, effectively sanitizing surfaces and equipment are critical to this list. In 2015-2016, locally there were 65,000 food safety violations due to food-contact surfaces not being properly cleaned and sanitized in restaurants. With that number from Florida alone, imagine the numbers throughout the United States. 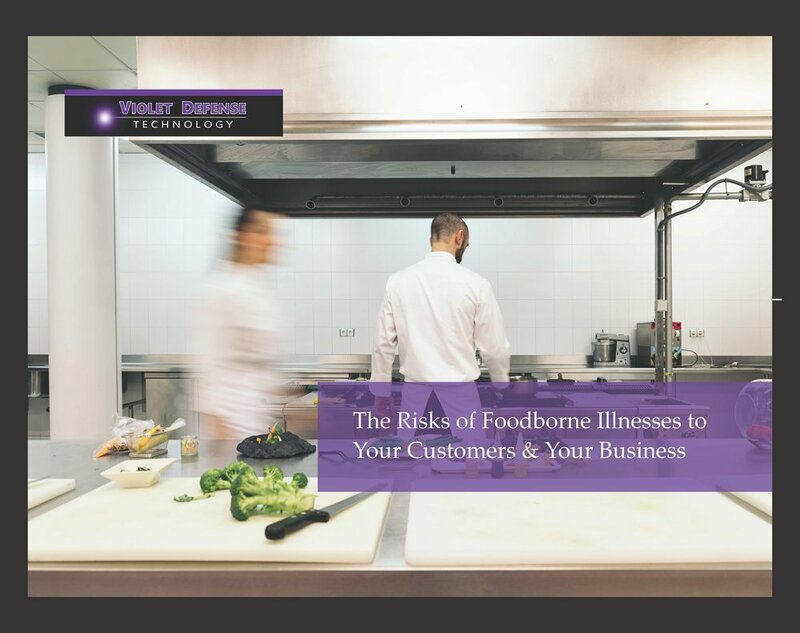 Download Violet Defense's Guide: The Risks of Foodborne Illnesses to Your Customers & Your Business to learn more about the risks your customers and your business face. Even with the best of intentions or highly trained staff - how do you know if you have effectively disinfected your entire space? Areas can be missed. Chemicals may have not been left on long enough to ensure that the germs you are concerned about have been dealt with properly. Adding another layer of protection could be the key. Ultraviolet light is a great way to provide insurance that you have effectively disinfected a space as it kills germs anywhere the light touches. To learn more about how Violet Defense can help bring UV to your restaurant or food facility to protect your customers and your business, contact us. Every detail matters to make the grade - both in terms of sanitation and the impression you make on your patrons. In my hometown, there is a regular feature on the nightly news – highlighting the latest restaurants to have failed their food and safety inspections – or talking about the latest local spot to have closed down due to inability to correct their violations in a timely manner. And of course, we have all heard the stories of a major restaurant chain that suffered a major hit to their sales (around 30% decrease) and stock prices due to multiple outbreaks of E. coli and norovirus in their restaurants. In Florida alone, there were 334,436 violations related to foodborne illness risk factors and public health interventions in 2015-2016 according to the Department of Business & Professional Regulation. Over 65,000 of those were due to food-contact surfaces not being properly cleaned and sanitized. Clearly this hasn’t been enough to majorly impact the restaurant industry – according to the National Restaurant Association, sales are growing with projected sales of $799 billion in 2017. But what is it doing to a restaurant’s ability to attract new customers and maybe more importantly retain the ones that they have. Based on a survey conducted on behalf of SCA Tissue North America, “80% of restaurant patrons believe that restroom cleanliness reflects the hygiene standards throughout the restaurant – including the kitchen and food prep areas.” Furthermore, the study indicated that a negative restroom experience doesn’t just turn away a single customer, but can create damaging reviews and word-of-mouth resulting in overall decline in customers. Violet Defense offers a bathroom fan cover as part of its Surface & Air Germ Elimination (S.A.G.E.) line that uses the germ killing power of light to kill bacteria in the bathrooms. The system uses an intelligent control system to automatically adapt its cleaning cycle to activate when room becomes unoccupied and adjust how long it stays on to match the level of traffic in your bathrooms. The whole room units can be deployed in kitchen and dining spaces to enhance your food safety efforts. The pulsed Xenon system deploys a powerful, broad spectrum of UV and violet blue light to kill bacteria and viruses, including E. coli, Salmonella, and noro-viruses. Not only does UV kill germs, but it breaks down grease as well. Due to our patented technology, our solutions have a very small form factor and can be seamlessly integrated into nearly any room. Ensuring food safety and cleanliness can be easy with UV room disinfection. Contact Violet Defense Technology today to get the solution that will help you meet your safety standards while assuring your patrons that you are putting their health and wellness first. Contact us today at info@violetdefense.com or 407-433-1104 to receive a custom quote to meet your restaurant’s needs.